While embedded vision was one of the big talking points at Vision 2016 in Stuttgart, Germany, new high-speed cameras - either line or area scan, churning out hundreds or thousands of frames per second - still made up a good proportion of the technology on display. 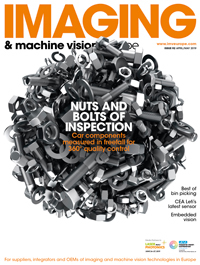 Industrial camera makers are benefitting from the latest complementary metal oxide semiconductor (CMOS) image sensors, which are gradually taking over from CCDs – to the point where CCDs could eventually be phased out. The latest CMOS sensors operate at higher frame rates, which has ultimately resulted in an increasing speed of machine vision technology. From its fast line of cameras, Ximea presented several new models at Vision, such as the XiB CB120, a 4k resolution camera equipped with CMV12000 sensors from Cmosis. These 12-megapixel sensors are able to achieve 330fps at full resolution. Ximea also presented a robust and easy to integrate camera that uses high speed, global shutter CMOS sensors from Luxima. These sensors offer fast data throughput with up to 3,500fps at a resolution of 1,280 x 864. Photonfocus introduced two software-defined CMOS camera platforms, in which the latest demanding CMOS sensor technologies have been combined with real-time FPGA image processing. This is ideal for industrial and metrology applications ranging from high dynamic range (HDR) to ultra-low light conditions. The cameras are designed for use in the fields of high speed, HDR and hyperspectral imaging. Additionally, Photonfocus will extend the spectral range coverage of its cameras by introducing a high-speed VGA SWIR camera. Among the new innovations presented at Teledyne Dalsa’s booth was the Piranha XL colour CMOS TDI camera. This colour line scan camera is built around the company’s advanced multiline CMOS TDI colour image sensor and delivers quality colour imaging with high speed, resolution, responsivity, and low noise. Teledyne Dalsa was also showing its TurboDrive technology that extends the data transfer rate of gigabit Ethernet to 125MB/s. In terms of fast data rates, Point Grey launched a 10 GigE camera family at the show, which enables image transmission at speeds up to 10 times faster than GigE with minimal latency and no compression artefacts. The first model in the range will use the Sony Pregius IMX253 1.1-inch CMOS sensor with a 12.3 resolution and supporting 4K60 Ultra HD video. Adimec’s recently announced Norite five-megapixel compact CoaXPress high-speed area scan camera delivers CMOS global shutter technology in a 1-inch optical format. The N-5A100/CXP is intended for high-speed multi-camera inspection systems, offering reduced system complexity in addition to increased throughput. Meanwhile, Sony Europe's Image Sensing Solutions division unveilled its GS CMOS series of cameras, the latest model in which operates at 154fps at 5.1 megapixel resolution. It uses a global shutter sensor and Camera Link v2.0 interface. Even with the introduction of newer CMOS technologies and more sophisticated shuttering mechanisms, both of which have higher imaging speeds at an improved quality, users of high-speed cameras are still demanding greater sensitivity and higher resolutions. From its Sweep series, JAI showcased a range of new industrial high-speed monochrome line scan cameras. Scan rates of up to 200kHz can be achieved by the Sweep SW-4000M-PMCL model with its 4k resolution CMOS monochrome line sensor, while the 8k resolution CMOS monochrome line sensor in the Sweep SW-8000M-PMCL model can reach a rate of 100kHz. Specialised Imaging’s ultra-high-speed video camera, Kirana – which won the UK Queen's Award for Innovation this year – was on display too. The camera incorporates a hybrid image sensor, enabling it to deliver high resolution and high speeds up to five million frames per second simultaneously. Lastly, it is crucial for the mass integration of high-speed cameras across multiple industries that they can provide both high quality imaging and fast data transmission at an affordable price for end users. In response to this, e2v exhibited its new Uniiqa+ and Eliixa+ colour line scan cameras, now available with an NBase-T Ethernet frame grabber-less interface. Both cameras provide a cost-effective solution for transmitting uncompressed, high-bandwidth images at the high speeds. Optronis addressed the matter at its booth with its highly standardised cameras for machine vision and 2D/3D automated optical inspection from its new CamPerform series. The series offers the latest technology in high-speed cameras while remaining at an affordable price. Optronis cameras have a modular structure, allowing individual components to be used multiple times, thereby cutting production costs. The fact that the efficiency of individual components is not exhausted to the maximum means that the system price can be lowered to an acceptable level.